Real estate • Townhomes near Utah's Capitol Hill are 95 percent solar-powered. Leah Hogsten | The Salt Lake Tribune The energy efficient solar units have a two car garage, two bedrooms and three baths. The Marmalade District Townhomes, Salt Lake City's first ever townhomes powered almost entirely on solar power, are for sale, Friday, March 22, 2014. The 10 units are part of a planned urban development helped by a land-acquisition loan to the developer by the city's Redevelopment Agency. Leah Hogsten | The Salt Lake Tribune The kitchen of a Marmalade District Townhomes. The Marmalade District Townhomes, Salt Lake City's first ever townhomes powered almost entirely on solar power, are for sale, Friday, March 22, 2014. The 10 units are part of a planned urban development helped by a land-acquisition loan to the developer by the city's Redevelopment Agency. 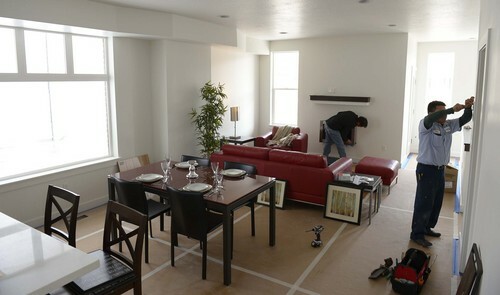 | Courtesy Photo Leah Hogsten | The Salt Lake Tribune The master bedroom of a Marmalade District Townhome end unit. The Marmalade District Townhomes, Salt Lake City's first ever townhomes powered almost entirely on solar power, are for sale, Friday, March 22, 2014. The 10 units are part of a planned urban development helped by a land-acquisition loan to the developer by the city's Redevelopment Agency. Leah Hogsten | The Salt Lake Tribune The Marmalade District Lofts, Salt Lake City's first ever townhomes powered almost entirely on solar power, are for sale, Friday, March 22, 2014. The 10 units are part of a planned urban development helped by a land-acquisition loan to the developer by the city's Redevelopment Agency. 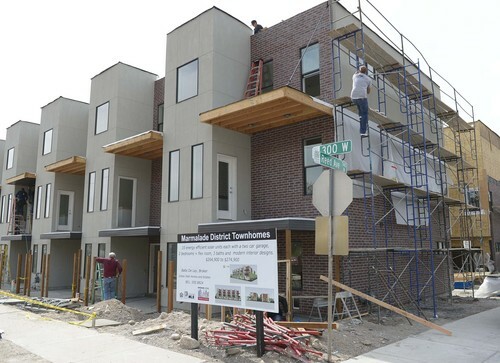 Just as Utah days get sunnier, homebuyers are being offered a look at Salt Lake City&apos;s first solar-powered townhomes this weekend in the Marmalade District. The Friday and Saturday grand opening for the newly built Marmalade District Lofts at 315 W. Reed Ave. (750 North) comes as real estate agents across the Wasatch Front hold similar events to ease into the summer home sales season. The townhomes also reflect shifting contours of green living in Utah, as well as a recent upswing for a downtown neighborhood whose fortunes have sagged in recent years. The lofts project is a planned urban development, coming as elected leaders continue to boost the area sloping west and north of Utah&apos;s Capitol Hill. Several new projects have gone up in once-blighted portions of the Marmalade, backed by the city&apos;s Redevelopment Agency. The neighborhood is also poised to get a new sizeable library and adjoining mixed-used development, with the much-anticipated Marmalade branch at 500 North and 300 West set to fill in what residents had dubbed the "Marmalade hole" sometime in late 2014. "Something is happening in Marmalade, something new and exciting," Salt Lake City Councilman Kyle LaMalfa said. "It&apos;s not going to be the same place it was 10 years ago." Four of the 10 solar townhomes just south of Salt Lake City&apos;s Warm Springs Park have sold already but the six remaining three-floor, two-bedroom, three-bathroom units  complete with 15 roof-mounted solar panels apiece  are open for tours. With their proximity to the city core and features such as electric fireplaces, yoga rooms, white quartz counter tops, two-car garages and even pre-installed dog doors, the lofts target younger singles and newlyweds drawn to an urban lifestyle, said Babs De Lay, broker and listing agent with Urban Homes and Estates. 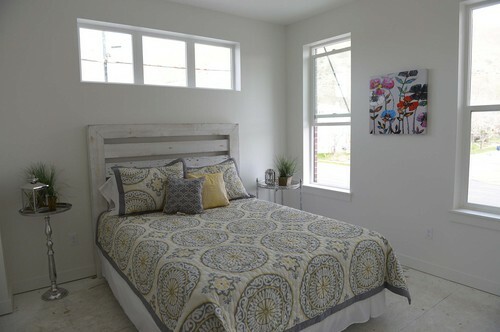 "They&apos;re groovy," De Lay said during a recent walkthru of the lofts, priced at between $264,900 and $269,900. The townhomes draw 95 percent of their electricity from solar energy, a milestone of sorts for Salt Lake City, reached as the cost of panels continue to drop amid improvements in efficiency, size and power yield. "Solar energy has become much more affordable for builders to offer to buyers in new housing product," said Nathan Anderson, the project&apos;s developer and head of City & Resort Properties in Salt Lake City. Buyers also will be able to claim up to $6,000 in alternative-energy tax credits on the units, Anderson said. "It&apos;s a win-win for everyone." Many Utah homebuilders and industry officials say that buyers are still focused on their bottom line when choosing a home, pushing green features down on their list of priorities. 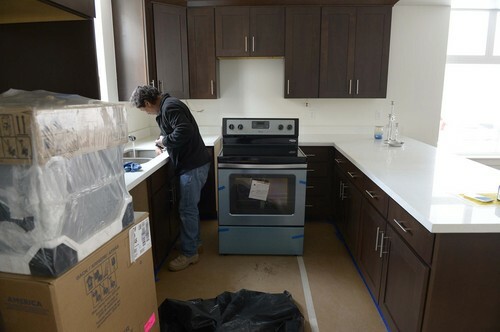 But the Marmalade District Lofts, new housing projects by Utah builder Garbett Homes and others are coming to market as attitudes on sustainable living continue to evolve, several national surveys suggest. An estimated 68 percent of builders say customers will pay more for green features, according to a poll released in February by the building data firm McGraw Hill Construction. That&apos;s up from 61 percent in 2011. Homes with environment-friendly features made up a little less than a quarter of all U.S. homes sold last year, but that market share is expected to rise to a third by 2016, the same study found. More than half of homebuyers questioned in another survey said they thought the benefits of paying more for a green home outweighed the costs, according to GuildQuality, which polls on customer satisfaction. Whitney Ward, president-elect for the Utah chapter of the US Green Building Council, which promotes sustainability in construction, said the shift in preferences appears to be generational. She likened the choice to buy an eco-friendly home to paying more to eat well. "People are becoming more cognizant about the impact of their decisions," said Ward, also an associate principal with Salt Lake City-based VCBO Architecture. "They are starting to see small additional costs as worth the return over the long haul." Governments, she said, also have helped the trend toward sustainability in Utah by requiring green standards on public facilities. Their main tool: LEED ratings, a package of wise building methods and materials, power and water conservation guidelines and more appealing designs. Once familiar with LEED, many builders have applied those standards to private-sector construction. Buyers and commercial tenants, in turn, are starting to demand them. Builders, Ward said, "just need that first experience to realize it&apos;s not that bad or that hard. Sometimes you just need a little shove."